New Classes & New product...Oh My! I am thrilled to tell you the store is just buzzing right now! It's funny how new product comes in waves and I think we have just been hit with a tidal wave!! I don't know if it has been the combination of the spring like weather, the new and fresh card classes or all the new products, but the store feels recharged! And all I know is that I am in the mood for a little crafting right now! Our orders from CHA have just started arriving! We have just received the NEW Basic Grey, Crate paper, My Minds Eye, My Little Yellow Bicycle (Lucky Me), Kaiser Craft and more! My favourite new product has to been the Smooch Spritz! The store has also been restocked with many of your favourites including a ton of cuttlebug folders, nestabilities, paper and more! Oh I almost forgot....we just received all of the new Distress Inks for Ranger! The colours are so gorgeous that Kell had to tear off the packaging and ink up her favourite stamps within minutes of checking in the order!! You spoke. We listened! You will notice that our classes are full of all the good things you have been looking for including new techniques, new stamps, cheaper scrapbooking classes and a wider offering of classes. Have a look and see what you think! Give us a call at the store to register! DO NOT email!! Such beautiful spring like cards, great for any occasion! Let Pauline show you ways to enhance your cards by stamping multiple images to create gorgeous backgrounds, working with Tombow markers directly on your rubber stamps, adding the perfect embellishments and working with Spellbinders dies. This is a great class for beginners or stampers of any level! Let Debbie show you how to make two very different and interactive cards. The first card is a wiper card which slides as you open it and has a little 'wiper' message that appears from inside the card. This card uses some of our new SEI paper (that has a beautiful polished/embossed texture), spellbinders, glitter, ribbon, brads and more. The second card is an easel card which incorporates more of that beautiful paper, glitter, edge punches and more. This class will build on the basic knowledge of copic markers but Linda will introduce coloured pencils into the mix and show how they can enhance and compliment your image. Please note that this is a techniques class and focus will be on colouring. No cards will be made in this class but rather you will better utilize you time by picking up colouring tips from the master herself! You will be colouring two fun images from Stampingbella. You must come equipped with all the products listed below. Required Supplies: Copics - E0000, E000, E00, E11, E31, E33, E35, G20, G12, G24, BG0000, BG10, BG05, R20, R22, R24, Y00, Y11 Prisma Premier Pencils - 1032, 904, 1005, 1096, 1090, 1088, 935, 1089, 912, 937, french grey 30%, french grey 50%, white. Michelle has designed another stellar one page layout! You will learn how to make flowers using ribbon, how to add secret journaling pockets, adding dimension and character to your layouts and more. We are so thrilled to have Shannon back in our line up! She has designed THE cutest little purse album perfect for a Mothers Day gift or for that girly girl in your life. This will be an action packed class where you will decorate Maya Roads purse album and the 8 pages inside. The album measures 4x8 in dimension. You do not have to bring your photos this night as there will most likely not be enough time to get to this stage of the project. Did you remember? Our first happy hours of the year was last Friday and boy did we have a lot of fun! 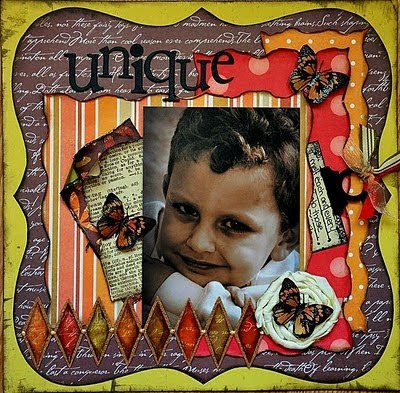 Kell created a gorgeous little card using the new Distress inks and Unity Stamps. We will have a new project THIS Friday. Don't miss out! Stop in between 3:30 and 5:30 on FRIDAY. So I had a really nice chat this past week with a woman who had recently moved to the Chatham-Kent area from London. She said it was nice to be close to her family but she missed the group of women who she would get together with on a regular basis to stamp. I told her about the classes we held 2-3 times each week in the evenings. She said they looked quite interesting but she said she was not comfortable driving at night. Then I started to think.....hey, we use to have one afternoon each week where people could just casually drop in and make a little project. 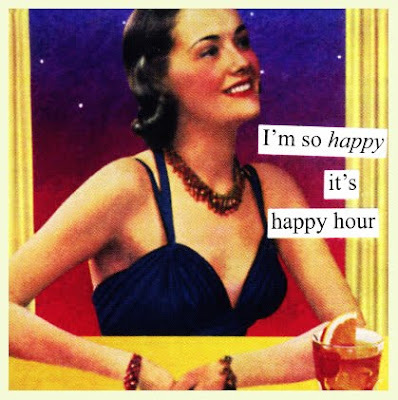 It was called 'Happy Hours' and it made our customers and ourselves SO happy♥ A different technique or product would be used each week on a little tag or card, etc. You know what? I kind of miss those Friday afternoons! And now that Kell is back in the store full-time, I felt like this could be the perfect time to bring back our Happy Hours. So starting this Friday, between 3:30 and 5:30, stop in and make a little project, learn a little and just have fun with your fellow paper crafter. Oh, and the best part....it's free! !